If you find a cheaper box (similar in size and material) within 2 weeks of your purchase we will refund you the difference. 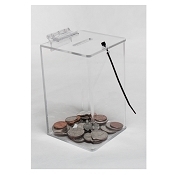 Donation boxes are typically smaller in size than a lead box or contest type box in order to be placed in prime locations near the check out or cash register. Real estate here is very valuable and a larger box may not fit or be accepted by the stores. 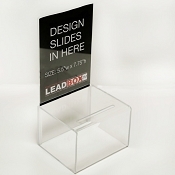 We created several smaller styles of collection/money donation boxes to optimize your collection needs. 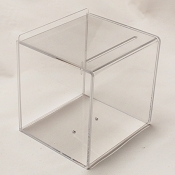 These boxes are perfect for bringing in more money to help with your fundraising events. We all know fundraising is a difficult task. Organizations are always looking for new ways to increase more donors. And donation boxes are a fantastic way of raising money. The most important way to your box's success is LOCATION. Placing collection boxes in high traffic areas most likely will increase amount of funds given to your cause. Make sure your graphics supporting your cause is clear and attractive. 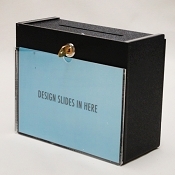 Our boxes are also available with add on options such as adding a business card pocket. 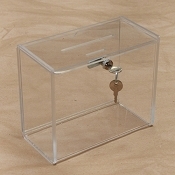 Most of our coin collection boxes include a lock which are keyed alike. The locks help prevent theft in high traffic areas where one cannot always keep an eye on the money bin. 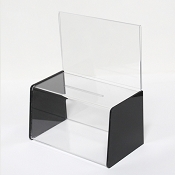 - Try to place your box near cash registers. There are several different styles of collection bins. There a coin cans which are cylinder shape and tend to be much smaller and more affordable. Your graphics wrap around it. 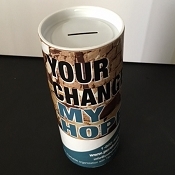 Money cans are great for collecting donations by going door-to-door. 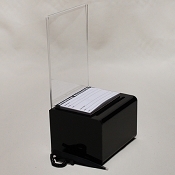 The next one up are the highly popular countertop donation boxes. 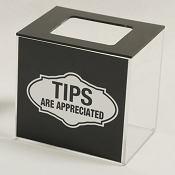 Perfect to place near cash registers or on tables. You can use them for any fundraising events. Lastly, are the floor standing boxes. Although these cost more, they are well worth the price. The floor stands are much larger and tend to draw in more attention from people passing by. 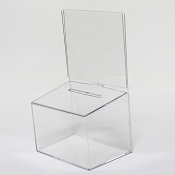 Please browse our variety selection of acrylic boxes, cardboard ballot boxes as well as our floor standing charity boxes. We offer wholesale quantities at low prices. If you cannot find what you need, let us now. We can create it for you. We want to make it as easy as possible for you to get your fundraiser started.